This weekend, for the Double Fine Game Club (a community run weekly event where we play through and discuss what we do and don't like about a game - sort of like a book club, but for games), we began our second playthrough/discussion session of Broken Age. 05:18 Hi and welcome to the Double Fine Game Club's second session of Broken Age, Act 1! My name is Cheese, and this week we'll be starting with something a little different. A live chat with Tim Schafer, who was writer and director on Broken Age. I'll be relaying questions from the #DFAdventure IRC channel on Foonetic.net, so hop in and join the discussion! We may also have some other developers dropping in, so be sure to keep an eye out for them and give them a very warm welcome. 05:42 Hi Tim, how are you? I'm great! Thanks for waiting for me. I'm glad to be here. I'm usually not able to come on Saturdays, so I always miss the Game Club because I'm out and about taking my daughter to swimming lessons. But here, since you're playing Broken Age, I just can't miss it. That's fantastic. Thanks so much for making time for us. 06:02 So, for people who may not be quite up to speed, would you like to tell us a little bit about yourself? About me? Yeah, I'm the founder of Double Fine Productions, the maker of Broken Age. I worked at LucasArts for 10 years. Basically all of the 90s, I was making adventure games for LucasArts. I worked on Ron Gilbert's Secret Of Monkey Island 1 and 2, and then Dave Grossman and I made Day of the Tentacle, and then I made Full Throttle and Day of the Tentacle [I'm pretty certain that Tim meant Grim Fandango]. Is that how far back you wanted me to go? Is that too far back? No no, that was good! It was good. 06:37 So, while we wait for some questions to come in from chat, how closely do you feel that Broken Age's development has mirrored the development of a typical Double Fine game, if there is such a thing? It was very different even though all of our games are pretty different. This one had that explosive beginning where it was a new story before we even knew what kind of game we were making, and we had all of you wonderful backers talking to us like you'd never talked to use before and it was like this worldwide crazy event. So, that was new and fabulous. And then also, we didn't have to worry about pitching a game to a publisher and getting it signed. The thing paid for before we ever started, which is crazy to think about. And then all we had to do was sit around and think about what kind of game we wanted to make, and it was all up to us. And just started brainstorming, so that way it was completely different than ever before. And also, the other main difference is that I usually have an idea in my head of the exact game that I want to make for many years before we ever start, but in this case, I wanted to start fresh, so we just sat down on the very first day with my notebook and I started thinking of ideas and Broken Age came out of that. So it was a very new way of doing things for me. 07:49 Do you feel that the documentary has been able to show the kind of sausage making that you'd hoped? Oh yeah! I mean, when I first started talking to 2 Player Productions about making a documentary, I was secretly excited for a lot of different reasons. One, I wanted to show in some ways how easy games were to make, not that they're easy, but that they're possible for anyone to make. Because when I was a kid, I thought that they were made by big companies that knew a lot more than I did, and then I realised I could have probably been making them myself - a lot of those kids making the original video games, some of them were 16 years old that worked at Atari, you know. So I like to show people that it's just a bunch of goofballs like you that are making games. And then I also wanted to show how hard it is, and specifically I wanted, deep down my secret wish was that I wanted people to see what we go through at the hands of publishers - you know, the kind of things they ask you to do - but I quickly realised that that was not going to be possible because no publisher would let us show that and no publisher would approve that footage if we had the meeting where they told us to put country western music in Brütal Legend, or told us to cut the humour out of Psychonauts. You know, I really wanted the world to see that, but I just knew that they would never approve of that, so we make up our own game idea. And so, what's happened is that people got to see us go through troubles, but troubles in a sense of our own creation. Like, by deciding to make a game that was bigger than the game that was originally funded, you know. Basically our own ambition with the game and our won - it was like at the hand of our own demons. Is that even? That's not even a phrase. I don't think that's a phrase. Anyway. We were just showing people, definitely going through problems, but it was our own budget, schedule and scope and all those kind of problems, which are still valid things that are important for anyone going into games, to understand that all games go through these kind of pressure. So, I still think we've done a good job with showing how the sausage gets made for sure. And we've just started to see a couple of questions come through in chat. There is a little bit of a delay, so anybody who's asked, we're kind of writing down the questions and making sure that they get asked. 10:00 map has asked, was it a conscious decision to open up Double Fine so much, and would you agree that "performative development" has given new life to the studio? "Performative" development? I think I guess what you're saying there is that we know we're on camera? Obviously, we're aware that the cameras are there, and we kind of forget that they're there after a while, but it was a definite decision to do so. Like I answered with the last question, I really wanted to show people what's behind the curtain in making games. And also, I felt like I wanted to show all the nuts and bolts of the sausage getting made. I hope they don't make sausage with nuts and bolts in it now that I think about that. But I wanted to show everything because I thought deep down, everything was good. Even though there are moments where there's tense meetings and there might be people disagreeing about stuff, all in all, you know, the people who work at Double Fine and the stuff we go through - they're all good people who want the game to made. So, I thought, you know, I'm not afraid of them seeing us fighting or failing or any of that stuff, because it'll all work out in the end. Which I feel like it did. Yeah, I think it's been a bit of an eye opener for a lot of gamers who aren't familiar with how this sort of stuff works. So, it's been really a positive thing to have, I think. I hope so. I mean, I hope so, I would have liked to have seen something like that when I was deciding to go into the games industry. I don't know whether we've scared people off or inspired people to go into the games industry, but I think that Double Fine though, is a very unique company. I'm very proud of our team and I think, especially watching from more of a distance, like with the Amnesia Fortnight videos - which are all up for free on YouTube, you know, you can watch those and see. I'm not involved in any of those teams, so it's really fun for me to watch the team behave without me, and I'm really proud of them, watching them go through creative problems together. Like I think you saw on Mnemonic, you know, Derek maybe underestimated how much design he should have ready in his mind before he started, or else he thought other people would have a bunch of puzzles, and there was a lot of confusion about how that project... you know, it was very slow to take off. It failed to launch, it seemed on the first couple of days... I think at another company, there would have been a real tense, possibly political battle between Brad and Derek, but then watching it, I was really proud to see those guys just, you know, like "Hey, we're all in this together. We want the game to be great. Let's figure out a solution that we both like," and they worked it out! And I think Mnemonic turned out to be one of the most successful of the prototypes - just really fun to play and really promising. I just like to see creative people work out problems, and I think that at a lot of other companies there's a lot of other dynamics, and some of them are good, but a lot of them are very toxic. A lot of them are very ego driven, and people just protecting their territory. You know, mostly political moves - that would be also another great documentary to watch, but I don't think any company would approve that footage. Yeah, that was pretty much exactly how it went. 13:16 AndyH asks, who was your favourite character to write for? In Broken Age, or ever? I think in Broken Age. I started really, just loving the spoon. It wasn't a character that was meant to really be a character. I think it was Derek who actually drew - or Levi drew a picture of this spoon talking and that just flowed out of the overmothering ship. So, I just started writing dialogue for him. I don't know why, certain characters just come to life as you write them. I just couldn't wait to write his next line because he always has something odd to say. You know, he has a different take on the world, and he's always present, observing things with you. And his heart's on his sleeve - it's always fun to write a character who just puts his emotions out there for everyone to see. 14:05 So, I've spotted that Broken Age seems to be a fairly commonly featured title when Valve are demonstrating the Steam Controller. When you tried it yourself, did you feel that it met your expectations, and were there any point and click adventure game specific concerns or opportunities that you could see it providing? Oh, umm, first of all, I didn't realise that Valve was demonstrating the Steam Controller with it. That's great news! Yeah, I saw a video of it at GDC. And I think that was awesome when the Steam Box came out, and I took my first Steam Box home and just to see, I downloaded every Double Fine game and I played them. I was like "This is awesome." They all worked. So, I feel so ahead of the game for once, you know, just having our games run on the Steam Box before a lot of people have converted to Linux. But anyway, I have played it on that, and yeah, it is really interesting. It's a great controller and it feels like an analogue stick when you want it to feel like an analogue stick, and then all of a sudden when you want to use it as a touch pad, it works as a touch pad. So, in stead of having to put you know... Broken Age wasn't designed to have like, a controller drive the character around, and I think that can work, but if you have umm... I'm trying to think about Zak and Wiki. Who makes Zak and Wiki on the Wii? I haven't played it, no. Some of the differences between an environment that was meant to work with point and click and an environment where you drive a character around, sometimes it can be really hard to drive a character through walk boxes that have been authored to be pointed and clicked on. So, anyway, I was really comfortable using the Steam Controller to make it still just point and click on the Steam Box, you know what I'm saying? It works well for that. 15:58 So, on the Linux front, Broken Age Act 1 has sort of been the first Double Fine title to simultaneously launch on all major three PC platforms, if I remember correctly. Is that true? I thought Brütal did that, but it may have been delayed by a week or two. We didn't get that on Mac and Linux, so it only had Windows rather than all three PC platforms. Brütal Legend is on Mac and Linux. I was going to say, do you think that we're likely to see future Double Fine titles releasing simultaneously on those three operating systems in the future? Ah, I think so, because we have that tech... you know, but the thing is what made it a lot easier for Broken Age is that we're using a different engine than we are with - our 3D games are made in what's called the Buddha Engine, which was made for Brütal Legend, and our 2D engine was based on the open source version of Moai. And Moai, the reason we picked that was so that we could be on all of those platforms at once. 17:08 And how has that experience been, working with Moai? Because that's the first 2D engine - aside from little Flash things here and there - that you guys have used, is that right? Yeah, it's been great. It allowed us to be on a lot of platforms right away, and that has been great. We also just wrote tons of stuff on top of it, so we have our own tool suite and editing stuff on top of that, and our basic adventure game engine on top of Moai. But under that, Moai just lets us be on Android, you know, we're all of a sudden on - we got it working on Ouya really fast, it was working on tablets. It just worked on everything right away, so that's been a great thing. 17:47 And on that note, Iirelu in chat has asked what the decision making process behind picking Moai was. It brought more people onboard, you know. More backers. Yeah... I'm sort of reading the chat and getting distracted by future questions. What were we talking about? Oh yeah! We wanted to be on a lot of platforms right off the bad, and during the Kickstarter, we were promising so many more that we just decided we had to get a heads up - I mean... a quick start on that, so we went with Moai for that, and we don't have any regrets there. 18:53 hasanbacker has asked, did you have an end of Broken Age in mind before you started writing the game? Whether or not you did, do you ever think of an ending before you're really into and develop a game from that as a starting point? Yeah, I mean I think I have at least the final plot point in my mind. You know, I know what everything was leading to with any game that I'm making usually. Like, I know it resolves, how the major conflict of it is going to resolve, and maybe even sometimes have that scene in my head. Like, with Broken Age the final scene in my head - I've had the final shot in my head for almost as long as I had the opening shot in my head, and they're different - I don't want anyone to think they're going to be the same. So I had exactly the way I want it to end in my head and now I just have to, you know, just have to navigate to that spot and make sure that that trip was exciting. 19:54 So, a question that was left in the forums by somebody who couldn't make it today. honeymaker asks, to what extent did the decision to focus on Bagel's style impact on the direction of the story and the themes to be explored in Broken Age? Um, not really. I mean, I had that story independent of Bagel's art, but Bagel, when we were doing the Kickstarter, I didn't start designing the game until the end of the Kickstarter, but he was working on it for all of the 30 days of the Kickstarter period. And he was kicking out just all kinds of random ideas, like this island with a bunny on it, and that cold water mermaid - I tried to get the cold water mermaid in the game and I just never found a place for it. It was going to be in Shellmound, but it was like a mermaid that wore a sweater. But one thing he had was this lumberjack. He had this lumberjack and I was like, "I just really like that lumberjack. I want to get that lumberjack in the game somehow." It took forever, and finally I figured out the perfect place to put him. Beloved Curtis. Everybody seems to love Curtis. It's great. Basically the backers demanded Curtis to be in the game. He was supposed to be just like a piece of test art. Yeah, I'm kinda glad that the dialog tree made it in in some way as well. Heh, for some reason I'm really drawn to taking stuff that is not supposed to be in and finding a place to put it, just because I hate thinking about these old things going to like the Island of Misfit Toys. And also, it's an interesting writing challenge. Like, a lot of people were worried when I was putting that stuff - when they heard I was putting Curtis in, and they were like, "How is he going to shoehorn that in? It'll feel awkward!" And it didn't feel awkward to me, and I just wanted to feel like - I wanted to set things up so that that felt natural and it fit in there. And I mean, I don't know if there's an illogical place to put a talking tree, but you'd probably feel it was ridiculous anywhere we put it, but I think the game world hopefully led you to believe that anything could happen around any corner, so it was natural to have a talking tree and a barking tree. 22:01 Taekon in chat has asked, did you get stuck while writing the story at any time, and if so, how long did it take you to get past that stage? Yeah, I got stuff for a while in the beginning. I had this basic setup, but it was a little bit bigger and there was like umm... For instance, there was a prince character in the town. The town was going to be bigger and you were going to walk through it, and there was going to be a populace in Sugar Bunting, but - and that's a common theme. Making adventure game, you always have a town, and then your schedule always becomes tight, and you always find for some reason the town to be abandoned or to have no people in it. Like, it's the Day of the Dead, everybody's gone to the land of the living! Or, you know, all the pirates have been kidnapped and they're all on this other island. You know, just because you can't have these big crowds of people walking around, because you have to make all those people and it's expensive. So, in our case it was like, well the Maidens Feast is going on and everybody's at the Maidens Feast. But I had a bigger town and there was a character who was called The Prince and a character who was called The Witch, and The Witch - because it was kind of, a lot of it was meant to be kind of a parody of fairy tales and princess tales. My daughter was watching a looot of princess movies, so I wanted to have this setup where there was a girl and there's a prince, and he's a handsome prince, and the normal setup of the Disney movie would have them getting married at the end, but I wanted him to turn out to be just evil - bad, just really bad. And The Witch was going to turn out to be good, but then she turned out to be not that great and she ended up being Levina Clench, who was you know, that lady who people thinks is Vella's Grandma, but is really just the organiser of the Maidens Feast. And if you look at one of the old documentaries, there's an old animatic by Majus of Vella escaping the Maidens Feast, and all the tentacles from the old Mog Chothra would go and snap at her feet, and then a shot of basically the Wicked Witch of the West waving at her going, "Come back here!" And that's because in the script I hadn't named Levina and I just always referred to her as The Witch, because she was kind of a witch. And then, I was like what are people going to think about that pointy black hatted witch in the animatic, but in the final game, that's Levina shaking her fist at Vella. There you go, fun fact. Brand new fun fact exclusive to the Double Fine Game Club. 24:33 lietu asked, since Broken Age was released, have you been able to tell if you will be making more adventure games after finishing Act 2? Well, I was kinda hoping more would be pitched with Amnesia Fortnight, because now that we have this engine, I would have to have someone else make one. I'm torn about making another one just because I've been reminded how fun they are to make, and also how hard they are to make. I mean, it's really hard to work on something for two years, and then have people whiz through it in four hours. It's tough, really tough - just you know, investment. I'd love to somehow find a way to make game - and I know people are going to say, well you just make the puzzle harder, but there's still, at a certain place there's a... adventure games have a certain setup where everything is experienced pretty much once. You really don't want to solve puzzles over and over again, so all those puzzles that are hand crafted can only be experienced once. And so, there is this frustrating thing where you don't get a lot of bang for your buck for all that work. They're still worth it, they're just very time consuming. Like a stop motion animated movie, you know. I think you've got to be just accepting that you're going to be doing a lot of handy work and it's going to take you time. But I do like doing a game that heavily features story and character, and I'd love to do another one, but there's always so many projects that we want to do, so who knows. Yeah, hopefully we'll see something of Redbot in the future. If you play Autonomous for the Leap. If you play that, he's dead in a junkpile somewhere. Nice! I was kinda surprised that he wasn't in Shay's toy room to be honest. I'm not 100% sure that he's not in the game. I mean, I don't think he is, but people sneak things in the game that I don't know about. He's pretty good about getting Redbots in everywhere. 26:33 TimeGentleman, who is Ben from Ben There, Dan That, has asked, "What has the Broken Age project taught you so far, and will you take forward into future projects? Good question. I mean, it's made me re-learn how to make adventure games and learn about puzzle design again, and see how puzzles look differently when you're start and you're designing them. They look differently from the front than from the back, like when the player approaches them, everything you think was frontward turns backwards, and remembering that has been a big challenge on this game and caused me to redesign the game a couple of times. What else have I learned making this game? I've learned - you know, main lesson that this is the game that changed our relationship with our community. We always had a community before, but it pretty much just on the forums and we talked to them once in a while, but the Kickstarter project was what engaged us with them and made them - made us realise how much they wanted to be part of the making of the games, whether it's funding it or contributing ideas and just sharing in the process as if they were a member of the team, and I think we try to take that forward in all the games we're making now. With Massive Chalice, just showing everything, letting everyone in on the process I think has been the biggest lesson taken away from that game. 28:00 Do you think that ultimately that's been a positive thing that's going to not only add value to the community - value for the people who want to feel invested and can feel invested - do you feel that there's stuff that you guys as a development studio are getting out of that? Oh, definitely! I mean, a lot of things. The first one is actually emotional. I mean, like when we got that Kickstarter, it was really just a big emotional punch in the arm, because you know, you don't often get those moments where there's this outpouring of support and positive vibes, and the team felt so great when that was going on. So, that's just one thing, is it's motivational, and the other thing is that they do contribute ideas, and they do make you see things from a different point of view, you know. Letting them vote on Amnesia Fortnight projects, you know they've picked projects that maybe I wouldn't have picked. I'm not against them being picked, but I didn't realised that people loved them so much and so, it was great that that happened. So, I think they're just adding their voice to a discussion, and that's always good. 29:08 So on that note, possibly steering slightly off topic, what are your thoughts on Bad Golf? Bad Golf! That is such an interesting phenomenon because it didn't - like, the very first time Bad Golf was in, Bad Golf 1, do you remember? It didn't do very well in the voting, and so coming into this next, this second round of voting, it didn't really do particularly well in the second round either, this year. It didn't do very well this year. But it was after the voting was over and Patrick busted out his shirt that did seem like Bad Golf fever took off. And I don't know if that's an essential part of Bad Golf, that it was such an underdog, and our community is just very underdog aware. I think they think you know, Double Fine is like an underdog, and so everyone just naturally started rooting for that game and then the community version got everyone in the office excited, and they're like "Ah, that's crazy that you could -" I mean, how weird is that to just dream up a game idea and then have it delivered to you by the internet? You know, for Patrick that must just feel really strange. Like, "I just had an idea and the next thing I know, there's this build with this Golf Cart thing running around." I loved what I saw of it when I played it, and I umm... That's just like - I mean, how often does that kind of interaction happen between a game company and its community. It's just like, they're saying "Hey Tim, don't worry. We've got this one." That just very unprecedented. Yeah, it's kind of feels... other studios probably would have handled things differently. Yeah, I mean, there's a lot of things this last couple of years that we've done that I think, I used to think, common sense would tell you are scary and you shouldn't do, then we just tried and found out that there was no downside to it. Like, "Oh, there's legal problems with that." There was just so many things at LucasArts which we wouldn't even touch because of legal reasons, like we would - I wanted to have people suggest names or something during Grim Fandango or just tell stories, and our lawyer was like, "Well, we have to let them know that we own everything they submit so they don't sue us later," and eventually the idea just died. I was just so frustrated, and looking back on it, like, who would have sued LucasArts because we printed their game name idea or something? Like no one, no one would. If someone's going to like, if we asked everybody for suggestions of locations, and Shellmound came from that, you know. Did the person who submitted the sandcastle town feel like suing us afterward? That's just ridiculous. I mean, I hope so. I hope it's ridiculous. 31:50 So, getting a bit more back towards Broken Age, in what ways do you feel that Broken Age differes from the adventure games you've worked on in the past, and what do you think that they share? That's OK. Hey printer. Cheer up. It's just a little water. Exciting! Yeah. See, I no longer fear moments like that anymore because we found out that people like it when things break and don't go right. That's why they play alpha funded games. OK, The water has been absorbed! Umm, Broken Age is different in that the story feels a little different, I think just because I'm older and I'm writing different kinds of stories. You know, it's a little more personal and a little more I guess human scale story. And, like the characters, to me feel more emotional. They're more, you know, talking about that kind of stuff, at least in my head they are. I think it's the same in that I really have this very similar approach that I've always had to identifying protagonists and antagonists, and pitting them against each other and just figuring out how they think about the world and how they're going to solve all their problems. So, I feel like it came from a very similar place in my mind as any other adventure game I've made. I think the other ones were a lot more inspired by cinematics, like I think umm, Full Throttle was you know, very much when I was really into - Full Throttle and Grim Fandango was both when I was kind of a, not a film student, but I was kind of like on my own studying film and really into, umm with Full Throttle, it was like Road Warrior. I really loved the Road Warrior, and I really loved George Miller and Mad Max, and also Yojimbo and Kurosawa films, and just relive the stuff that went into those films and the moment that it happened and wanting to recreate that in the game. So, there were a lot more cinematic moments that were inspired by movies, and then obviously Grim Fandango had a lot of moments that were inspired by Casablanca and The Big Sleep and Gilda; film noir that I was really inspired by, but there's not really any sort of cinem- well, OK, now I'm going to say that all and take it back. There's not like one huge cinematic movement that inspired the visual language for Broken Age. I mean, there are a lot of influences on it, and the closest I would say would be Miyazaki movies, that they influence some of the visuals and also the treatments, I think, of the main female character, in relation to like Kiki's Delivery Service or Nausicaä, I think. But that's another, I guess difference, is that it had, it has a - it doesn't have a big, themed backdrop to pull from. It's not like it's mexican folklore meets film noir, or it's this kind of apocalyptic brutal road scene, like it's its own world which makes it a little more intimidating because when I'm coming up with place names or fantasy, I have to make up all that back story stuff myself, so that was really different. Yeah, it does feel like Broken Age has, sort of fewer popular culture or cult references than previous stuff. I just realised that called Full Throttle apocalyptic, even though I've always maintained it's not a post apocalyptic story. It's just an alternative world, and I just want to state that, but it's easier to say "apocalyptic". Oh wait, I guess "apocalyptic" is different than "post apocalyptic". Whatever. That's Peter McConnell. Because he put that bomb song in there. 35:57 sughly in chat asks, do you find writing something with branching sections like an adventure game is sometimes hard to - [reading fumble] umm, wow - makes it hard to keep focus on character development and such throughout all the dialogue and interaction? Wait, I got a little lost in that question. Is that there?I was trying to read that. Umm, it's actually a little way back. I think the question was about when you've got, you know, branching interaction and dialogue trees and so forth, is it - how do you overcome the difficulties of maintaining strong character focus and strong character - consistent character focus and strong character development? When you've got this kind of multiple possibilities and multiple potential outcomes. We don't even get to do THE WAVE. Hey, the game's not done yet! I mean, we have to be very state aware. You know, has the player solved this puzzle? Then when they talk to Marshal Dune, Marshal Dune is friendlier after you've helped him, you know, fix the sandcastle problems. So, I mean, they're definitely aware of the state changes and dynamic in that way, but it's not like you could either kill Marshal Dune or not, right? You have to kill Marshal Dune. Oh wait, that's only in part two. Maybe. Maybe not. Maybe I'm kidding. Maybe I'm not. I don't know. 38:38 Permafry asks, what do you think today's developers could learn from older developers that they usually don't learn? Let's replace "older" with "yesterday's". Wait. I'm "older". I feel that's better than "yesterday's". Actually, I don't know which is... "more seasoned", there we go. Veterans! They call us "veterans". That implies a certain amount of warfare. Umm. I mean, I don't know. I think if you ask the old veterans, usually they're like "Yeah! The whipper-snappers don't know much like we used to!" But I really feel like it's some of the older, seasoned veterans who need to learn a lot from modern game makers, like a lot of the games being made today - like indie developers like Journey or you know, Sword & Sworcery and stuff, I think are just like trying new things that... well, I mean, maybe that's not fair, because we all try a lot of new things when we're in our twenties, and then we kind of have the success or failure, and then we either repeat the successes, or we try something different if we have failure, but it's really hard to keep trying new stuff as you get older. But I think that's the important thing, so I really think that the old people have a lot more to learn from young people than the other way around. 39:54 Iirelu asks, did you have the speedrunning community in the back of your mind when you let people skip the walking and cutscenes, and did you know that Act 1 can be completed in under 15 minutes? I've never heard the final speedrun number. I think about speedrunners once in a while, but mostly it's just for people who play the game. I think more about backtracking. You know umm, one of the unfortunate things that was mentioned about The Cave in reviews was people thought that backtracking was a pain, and in an adventure game, that's totally normal. You go from Scabb Island to Monkey Island™, you know, you go through all these islands all the time. You can't just play through the game in one big linear push. You have to backtrack all the time, but we put in these things in adventure games to make traversal really easy, and traversal is harder in The Cave, and that just kind of highlighted how much backtracking there was. So, we always try to make, like, starting with Full Throttle, just traversal be kind of trivial, so if you did forget something, you're like, "Oh! Click, click, click, click. Oh, I'm back there," and then you can click back really fast. But we've always been very convenience oriented. I think Ron, if you ever hang out with Ron Gilbert, he will just critique the efficiency of... yeah, the efficiency of any kind of interface he's using, like, "This ATM shouldn't ask me this question twice!" It drives him crazy, so he's always trying to simplify things and make them efficient. 41:25 In what ways do you feel that the success of the Double Fine Adventure campaign has changed Double Fine as a studio, if at all? I mean, I think it's mostly that stuff I was saying about the community involvement. I think that's the biggest thing, that we've gone into high gear, as far as being transparent with our community. But it's also changed the entire world for me - I mean I think, not just our Kickstarter obviously, but all the things going on in the entertainment industry are all trending towards getting rid of the middle man, getting rid of the gatekeepers. It's more just the people who are making art, and the people who are consuming the art, and nobody in between. At least, nobody who's super powerful, like the old studio system in Hollywood where you had big companies with a lot of artists under contract, you know, that whole model. Because movies are really hard to make, and individuals couldn't make movies back then, so you needed this big company to get them made, and that's the way it was with AAA games. And it still kind of is that way with AAA games, but it's moving in the other direction, where everybody - everybody's figured out how to download Unity or GameMaker and make a game. You no longer have to press a disc or hire a truck to drive it to a store. You don't have to do any of these things, so there's not really a need to have a big company anymore, especially now that we can fund them ourselves with Kickstarter. So, it's going to be interesting to see what happens to the artform when it can be just made by someone who is passionate about it and played by somebody who is passionate about it, with nobody else in between. Like, maybe we'll find new problems, but I look forward to it anyway, because the old way was not really working. 43:02 And where do you see Double Fine being in two years' time? Well, we push more and more with - towards full independence. Like, we started independent publishing when Steve Dengler, Dracogen, invested in the PC ports of Stacking and Costume Quest, and when we published those, and we got money back and we got to keep the money, we were like, "Wait a second. This is very interesting! We should do this more." And when the Kickstarter happened and allowed us to self publish Broken Age, and then getting the investment from Indie Fund for Hack 'n' Slash and Spacebase allowed us to independently publish those, we realised this is what we should have been doing all along - to have this creative control and it's more financially beneficial. Not just like, "Oh, now we're getting rich," but now we can actually make money off of games that are not... Titanfall. Like, you don't have to compete with Titanfall to make a living. You can make a game that sells 200,000 copies and that actually can make you a lot of money. And you know, ever since it was considered a failure that Grim Fandango sold 500,000 copies, I was like, "That seems so weird that can't make a living off 500,000 people liking what you make." You should be able to, and independent publishing allows us to actually do that. So, we want to be more and more independent, and I mean, right now, we're still working with publishers, like Midnight City, they're doing Costume Quest 2, but we only have to work with good publishers who let us keep our IP rights, and who let us make the games the way we want to, so we're more in a position of power when we're signing those publishing deals. 44:40 I've noticed Bales in chat has asked, how are you responding with regards to puzzle design, after criticisms of Act 1 highlighting it as being too easy? Oh, well now all the puzzles are going to be like a punch in the face. Like an ice pick in the eye. I'm sorry, is that too hard? Does that sound too hard? Definitely, I mean you can see in the documentary, I was already thinking about this before Act 1 was done, because after we cut back on the game just to fit it in any sort of schedule, I felt like the puzzles needed to be harder, or harder especially in Act 2 than Act 1. Because I felt like it was fine in the first half of your game to kind of, let everybody in and no one really getting stuck, you know, in the first half, and just easing them into it and then ramping up the difficulty later. I think the hardest discussion, the more difficult discussion is who... it's hard to say who's right about what difficulty level of the game should be, and it's a complicated question because things are easy in games for different reasons. Sometimes they're easy because you're really just saying the game's short because that's all the number of assets we had the money to make, and so I was always worried about that. Even though the Kickstarter money paid for a certain amount of assets... basically the Kickstarter campaign paid for a little bit less than what people got in Act 1. So, that's how big the game would have been. And I knew that people would feel that was way too short, even though it was totally fair to be that size, and it was always a question that was on my mind of how to make a satisfying experience with the same number of programmers and artists and time that we had. That's one thing that goes into it. The other thing is... there's actually just good puzzle design. Some things in the game were too easy because of puzzle design errors on my part, and those are definitely something that just should be fixed. You know, I've even attempted to go back and fix them in Act 1, but that's something I've definitely been aware of in Act 2. I mean, to give you an example like, I always like to think of puzzles in terms of, "OK. This player has entered this area. What do we know they have in their inventory? And... They're locked in this area. What's in that area? What are the special properties of that area?" And those are the ingredients that we use to make our puzzles. And we're like, "OK. If they only have a stick of gum and a lamp and a poodle, like, how can they use that to both have a problem and find a solution?" And one of the problems with that, I realise, is that if someone walks in the room and you say, "What does he have in his inventory? OK, let me make a puzzle out of that," they automatically have the solution in their inventory and they can just walk up to you know, someone and give them that solution and then it's over, and that leads to puzzles being a little bit too easy. So that's something that, definitely we've been conscious of in Act 2. And then, I feel there's also an argument for some of the other parts of like, Act 1 should be easier, and I think there's a lot of people who feel that adventure games should be easier. I'm torn on that one because I think a lot of games are too easy in general, that people are told what to do and are just satisfying tasks now instead of really engaging their mind and solving puzzles. But, I know that a lot of the old adventure games that people really love, part of the reasons they never got any more popular was that they were so - like, the monkey wrench puzzle in Monkey 2. There's a lot of people like, they do not find that appealing, and there's a lot of people who find that very appealing or they like it after they've gotten though it and they can play it again and show that they know how to get that monkey wrench, you know. The old joke that Noah Falstein tells is like, asking an adventure game player why they like hard puzzles is like asking someone who's banging their head against a wall why they like banging their head against a wall, and he says "Because it feels so good when I stop." That was always his joke. So, I think the answer is somewhere in between. Like, you have to make good puzzle design decisions to make sure the puzzles are not any easier on accident than they need to be. And then I think you either have to put difficulty modes in, which we just don't have the time or budget to do, or you have to accept that you're going to set your difficulty bar at a place where some people will like it and some people won't. There's not really much you can do about that. 49:08 Marykate in chat asks, does being independent, or aiming to be independent, conflict with making console games? It used to! That's a big thing that's been really great. That's why we never announced any console versions of Broken Age in our Kicksarter, because we wanted to self publish, and at the time it wasn't possible, and since then, it's possible on all three of them, which is amazing, right? I mean, you used to - to get a publishing licencing agreement for a console maker, you just had to give them a deposit of $500,000, you used to have to ship to retail games, which, who has done that in this day and age? All these crazy rules that would make it impossible to publish on consoles unless you went through a big publisher. And miracle of miracles, all big console makers seemed to actually hear that and change one by one. The landscape is definitely shifting at the moment. Yeah. Indies definitely have much more power and control than they used to. People, I don't know if they're seeing the rise of things, or if they're surprised by things like Minecraft coming into the picture, but people definitely realise that indies are where - I think they know that's where innovation is going to come from. I always compare it to the Sundance Film Festival, people see that a lot of the future big movies are coming from a small festival, and that's because the mechanism that makes the AAA products, like you know, big AAA games is not necessarily going to be where innovation comes from. 50:50 So, just to make sure we're not eating up too much of your time, you're welcome to pull the plug when you're ready, otherwise we'll probably eat up as much of your afternoon as you're willing to share with us. Well, I can hang out a bit longer because my wife took my daughter to the video store. Hi Marykate! I'm trying to recognise all these people that I've seen on Twitter and all these kinds of... Bidiot Bales. I think we have Meeps in here somewhere. If he's not here, I should probably message him and ask him where the hell he is. Meeps. He's not online. He's going to be sad. 51:32 Has your Ballblaster story come back to bite you in your own hiring processes at Double Fine? You mean where I accidentally confessed to pirating LucasArts' games in a job interview? Yes and no, I mean, I just assume people pirated my games at this point. I think piracy is much more prevalent than it was, even in the 90s. You had to be smart to pirate in the 90s, and I think pretty much you don't anymore. Not that I was smart. I had a smart friend who pirated... But, it definitely had its revenge. I definitely probably lost more money from people pirating my games than I made by pirating people's games when I was a kid. You know, it's just stopped thinking about over the years because there really isn't much you can do about it, and I think the answer in some ways was the Kickstarter. Like I mean, I think a lot of people who backed our Kickstarter were people who would had pirated our games, and I think they don't want to pay for something when they don't want to, and they want to pay for something they don't have to pay for. They just want to be in control of what they're paying for and they want, you know, to feel good about it. They don't like being treated like a criminal and you know, the DRM punishes you even though you paid money for a game, and so I feel like new models for the economy of games have shown up, where people pay in different ways than just tearing tickets at the door, yo know. Because I think it is too hard. I don't think - I just love that thing about - what is it, that popcorn thing that's totally going to make movie piracy super easy. I think people have to find out different ways of getting people to... to make money off games. I feel like, with indie games, the whole model is to just make them as cheap as we can, and then be able to live off the sales that we do have and just hope that any pirated copy is just helping you sell more games eventually down the road. But what are you going to do about piracy? I still have a magazine from the 80s, like A.N.A.L.O.G. magazine with a full page ad from Atari saying, "Piracy: This Game Is Over." Well, look at Atari today. Yep, I guess piracy won that one! 54:04 A little while back, frogg in IRC asked, was there an active decision to have a non-white protagonist? Umm, I don't know if it was something that we got together as a group and sought out. I think it's more of just something that didn't strike us as weird when it just kind of developed that way. Because it's a fantasy world, so you never really talk about this character being from one continent or the other, you know, because those continents don't exist in that fantasy world, it was really just the way umm... I mean, originally that character started as a drawing from Scott Campbell, and it was black and white, it was just a line drawing. You really can't tell much from there, and then when Bagel started painting her, she just developed that way, and she just seemed cool to us. And it wasn't like we really thought about where she came from, but we just liked the way that that character worked out. I don't think we should take credit for... I don't want to sit there and say - to take credit for putting in that in on purpose, it's more I would take credit for not being, not stopping that from happening. That's probably the best thing we can say about ourselves. It didn't occur to us not to do it. I hope that's not disappointing for people. I mean, it was just like - in some ways that's how things are supposed to be, right? You just draw your characters and design them the way you want them, and it just turns out that they all look different. Yeah, yeah. No, that's really positive. And the real random thing is that we cast the voice just by listening to the voice and we were not even thinking about one particular ethnicity in voice, but after we were casting, we were recording Masasa Moyo, I looked at her picture and I was like, "Wow! She actually looks like Vella." It's crazy. These things just worked out that way. 56:04 So, on the note of voice actors and stuff, I've noticed couple of people raising the question of why there's such distance between Vella and Shay's voice actors in the credits. Yeah, it's not alphabetical, and it's not by order of appearance. Oh. Well, I mean, there's some things that are figured out... at a level... let's see. It's a tricky one. Yeah. Exactly. Basically, some credits are set... umm. When you're doing credits, sometimes there are rules that are set by other agreements. Let's put it that way. Yep. Yeah, that's fair enough. Because then those credits are just, you just start with the character in order of what you think the main characters are, and then go through it like that, and then sometimes you get a list from agents and stuff of what order characters should go in, and sometimes it's somewhere in between. So, with our cast list in this game, like with Brütal Legend, it was so star studded that those things had to be umm, negotiated and kind of tip toed around. It happens in movies all the time, so it's really not a big deal. Yeah. It's good to get some comment on it. We ask the hard questions hitting questions here at Game Club. 57:47 Over the past 10 years, do you feel that there are any standout point and click adventure games? Feel free to mention Ben There, Dan That if you've played that. Yes! Those are obviously, TimeGentleman is very, very excellent. I mean, there weren't that many... I think a lot of our fans were playing them during a period when I was not playing them, because I was really - part of the reason I started making console games and Psychonauts was because I was really getting into playing console games. And I'd always been a console player from the 2600 or the Odyssey, since the first time I had an Odyssey, and the joysticks! But umm, and an Atari, I had an Atari 400 and 800, that was more my era. I was talking about this in that Polygon interview I did recently, I think, where the whole reason, well, I guess the whole thing of why Grim Fandango has tank controls, because I was starting to kind of become a console game maker, or just really liked - I had just this big epiphany when I was playing Mario 64 for the first time, and you just run the character where you want to go, and I felt like, "Wow, this character - I feel like I'm immersed in the environment!" Which is really what I'm always trying to do with adventure games, and I feel like I'm directly immersed in the environment and I really, really love this. And that's not why Grim has tank controls, Grim has tank controls because of BioForge, that PC game BioForge that came out. And also Resident Evil and Tomb Raider and all the tank control games at the time. But that wasn't your question, was it? What was your first question? No! I have been meaning to. I've been meaning to play that one, but I have not. You know, when I... even before I worked at LucasArts, I tell this story about how I had played a point and click graphic adventure before I got my job at LucasArts, but there weren't that many at the time. But the big thing that I played at the time was text adventures. I was a huge text adventure player, played all the Infocom games and all the Scott Adams text adventures, so I was always more of a text adventure player than a point and click player. 61:19 Interesting! Do you think that Double Fine might look towards doing a text adventure? I was kind of hoping that we'd see something with Eras of Adventure if that got somewhere. Yeah, but that, oh man, that game would have had to have like five engines! I love Limbo, too. Someone in the chat is calling that an adventure game? It's kind of an adventure game. Bit more of a little platformer though. It's physical based. 61:52 TimeGentleman has asked, if the stars align such that Day of the Tentacle, Full Throttle or Grim Fandango saw some special edition type development, is there anything that you would be interested in seeing being done to those? I would love if people could just play Grim Fandango without pirating it. You know, there's no legal way to buy it, except for on eBay. I would just love for it to be available! That would be a huge thing. But I don't like thinking of someone else working on it besides us. Like, I think the special editions of Monkey Island were good. Mostly because you could play them with the classic art. You know, I think but it was mostly that you could play the original games again. But I think they did a very respectful treatment of those games, and I would like to do something - I would love to be involved in something like that. Like I found out about the special editions after the fact, and got involved, and it wasn't until the second one that we actually did any sort of commentary or anything. But we did manage to steal the lead programmer, Oliver. 62:55 TimeGentleman has also asked, what is The Secret of Grim Fandango™? Did you have in mind what it was that Manny had done that he needed to work off from the Land of the Living, or is that something that sort of, some MacGuffin that you didn't really intend to expand on? I mean, I think that's a good question, but I don't know if I should answer that question... because I think that it's covered in the work, and anything outside of the work should be covered in some other work otherwise it should be guessed at, don't you think? Yeah, I think that'll sate his question. If it's not in the book, then it's not yet... you know what I'm saying? Does that make any sense? 64:35 A couple of people have asked in chat, I think Permafry raised it, whether or not there are any plans for physical or retail versions of Broken Age for non-backers. Sorry, I was reading the chat again. What? What? Are we likely to see boxed versions of Broken Age available to non-backers at any point in the future? Yeah, I mean I think the way we talked about it was that the big cardboard, kind of retro 90s box was going to be for the backers only, but inside the box I think there's going to be like a DVD case in there that people could also buy. I think. It's been two years since we made that decision, but I feel like that's where we landed on that. That people could buy a smaller, simpler version of the box copy. Why are you laughing now? Because TimeGentleman has just asked if Manny [in unison] is gay. Oh! I'm sorry, was that not clear? I hope I was making that clear, that Manny is totally gay. No! I mean, I don't think so. But that's what I'm saying! That's up to you, that's up to the player to decide whether the character is gay or not. Just drives me crazy when people make stuff and they think that... Just because you're the author of something doesn't mean that you actually own it. You know what I'm saying? Like, I was telling somebody once about - I know I've said this in an interview before, this is probably repeating the story, but I was telling somebody once about this bully that used to pick on me in the sixth grade, and picked on all our friends, and we were all terrified of him. And I was talking about how his name was Bobby, and someone was like, "Bobby? Like Bobby in Psychonauts?" And I was like, "Oh my god..." Like, I had no idea that I had done that. I just like wanted a bully character and I just named him, without even thinking about the sixth grade, I just named him Bobby, and it was a subconscious thing. And then I realised that a lot of the things we put into art or games or whatever - or both - they're subconscious. And we think we made all these - You know, there's a lot of decisions that we make on purpose, like, I want this character to be red - wearing red, because red sounds like danger, but really, it's because there was a dog with a red collar that bit you when you were a kid or something. You don't know! You don't know why you make these decisions. And so, when you say, you know, "Everybody's misunderstanding my game, it means this. There's a secret message in it and this is the meaning of my game, and everyone was wrong when they said it was this other thing," I think that's wrong. I think you can't tell people, you know, the meaning of anything, because it's up to them to pull out of it what they will. Yeah. Sold on floppies. Five hundred floppy disks. Have you worked out how big - how many floppies you would be distributing it on? I'll put Oliver on that task for the next statistical dump that he does. The funny thing is, he'd really enjoy that. 67:25 Peabop has asked, when you finish an adventure game, do you miss writing and, as a writer, interacting with that game's particular characters? Nooo... not really, because it's always really fun to finish a project, and it's always fun for me to walk away from a project. I really like walking away, and just putting a wrap in it and saying. "That work is done." And so, I never think about I'd like to back and write for that character again, except for if I was really going to open it up and do a sequel. Then I would have to get right back into that character again, except for it'd be a new character in a way. It'd be the sequel character. I mean, I like them all. I like all our old characters. I really like thinking about Glottis and Eddie, and I like, you know, Raz. And I like thinking about their voice and all that, but I umm... I don't know, I just always like to think about new things instead. I think that, like, as a creator, that's a really difficult thing to balance. The old and the new? Yeah. I mean, you kind of, you love the stuff that you've done, but you also, you know, you've got that creative drive to create new stuff. But working at LucasArts, you were surrounded by his things, and you know that he - I feel like he is a creative person, and I don't know how he must have felt, being kind of trapped in this prison of money. You know, like, he had this successful idea. You know, what about his second idea? Or his third idea, you know? I think about these issues about creativity over long periods of time a lot, because I just think it's so interesting how - you know, most people are not creative forever... or they're not successfully creative for ever? Most bands, you know, will make four good albums if they're lucky, and then, you know, a bunch of bad ones. It just like, it seems like everyone eventually just putters out, and I really, I wonder how to keep that alive. Because I don't think that happened with like, van Gogh or Picasso or Beethoven. They seemed to like, manage to work until their old age and come up with interesting stuff. I was talking about this with Peter McConnell, and he was just like, "Well, those guys are better. Those guys are better than rock stars, and that's why they make better stuff when they're older." But I also think part of it is just trying to stay new, and engaging in new ideas and new worlds all the time - new challenges. Because I think, there are a lot of people and a lot of them are good friends of mine, who have made you know, one thing, and had success with it, and then just kind of stuck with that their whole creative careers and tried to get it made over and over and over again. And like ported and brought to different mediums. And part of me just feels like, "Let that go. Let those characters go and write your next characters. That'd be great." 70:19 On that, sort of, line of thought, how much did you feel when - because it's been a while since you've done a point and click adventure game. I mean, did you feel that there was pressure or expectation on you to perform at the level that you'd previously been doing stuff at? You know, was that something that you had concerns about? Well, as you get older, you think about performance a lot. So I mean, I did think about that, but I felt like I could make one. I felt like I still had all the parts necessary to make an adventure game like I used to, and probably knew a lot more about games and life than I did back then. But adventure game players - I mean, I don't want to lump them all together, because there's a big spectrum of them, but at their core, there's a very hard to please bunch at the core. I don't mean to put them at the core, but there's definitely somewhere in there, there's a very hard to please - I mean in basically any subculture, there is a real die hard group that just is really... really tough to please. But there's a lot of other people who also just like adventure games, so in the end, you know, you don't think about that kind of stuff, you mostly just think about your job and how to do the craft that you are trained to do, you know? 71:48 liorean asks, what kind of writing do you prefer? character based, setting based, puzzle based, et cetera? Well, I guess... I never really thought about the writing as being setting based or puzzle based. I mean, it's all one big thing to me. I mean, I usually start with games that do often think about location first, but not every time. Like, Grim Fandango was definitely the land of the dead was what I wanted to make, and the world of bikers, you know, or with Ron, Pirates of the Caribbean rides, you know, just because it's definitely a setting you want to jump into and then you start thinking about what character you want to be in that setting, like the grim reaper or the leader of a biker gang or a pirate. And then the characters come out, and the characters have to solve puzzles, but you're writing them all at the same time. You know, when you're writing dialogue, you're writing dialogue for puzzles and the puzzles reflect on the environment, so I really don't know if there's - I don't feel like there is separate writing that's character based writing or location based writing or puzzle based writing. I think they're all the same thing to me. 72:57 One of the things that I found personally resonated early on for me in Broken Age was the, kind of the parallelism between Shay and Vella both being responsible in some way for the survival of the heritage of their families and loved ones. So, Shay has, you know, got the Project Dandelion thing going on, and Vella's town is potentially at risk due to her actions. Is that, you know, those parallels between the stories, is that something you purposefully chased, or was it kind of a happy accident? Well right there, that's a good example of like, maybe I think I know why I did that, but do I know why I did that? I don't know! I would say those are both in line with larger themes that get dealt with more in Act 2, and I think that in general, like... I mean yeah, species propagation and coupling and mating rituals and all that stuff, I think is a large theme in the game. And effects both their lives, so I think that it makes sense for it to be in both stories. So, I'm going to take credit for that one, say I did that one on purpose. 74:12 Permafry has asked what your thoughts on the more modern, lighter object based interface versus a verb based interfaces in adventure games. Do you think there's still space for verb based interaction or interfaces or do you think that there's kind of... more automatic, I guess, interfaces is kind of the direction that things should be going in? Well, I mean obviously since we made Broken Age with a single touch, kind of single verb interface, that's the one that I feel was the most interesting to make a game in now. It's just a continuation of everything we were doing in Lucas... and I can remember being at the ranch, so it must've been like the first year I had a job there, meeting after meeting, talking about how many verbs to have in these games, because Ron had fifteen in Maniac Mansion, but he was like, "Let's get rid of some of these verbs." Like I said, he is very efficiency driven, and he brought it down to nine for Monkey if I'm counting right. If I'm remembering, I don't know, but less - fewer! Fewer verbs. I'll say nine. I'm going to stick with nine. And then you know, brought that down to, I think Throttle had maybe four, and it just - but when we had those early discussions up at the ranch, part of the debate was like, is it interesting to have an "open" and a "close"? Because if you go up to a door or a jam jar, you know, and if you say "close" and it's already closed, that's really not that interesting. Like, maybe somewhere that's a solution to a puzzle, closing a closed jar, but I don't think it is, and neither is opening an open jar, and opening a door and opening it again - it's just not that useful, so let's just make one verb called "use", and if you use a door and it's open, it closes, and vice versa. It's like a toggle, and does that... As we started doing that process, we realised that a lot of the verbs, "push" and "pull", were not often used to really definitively solve puzzles except for maybe the safe in the storekeeper's room in Monkey. You know, like very rarely were pushing and pulling different or using opening or closing or turning on turning off, all that stuff. It was all just use, and it was use but a context sensitive version of use, and we realised that if you design your puzzles so that the context matters, you can use just the use verb. But we were scared at the ranch, like, I think we're going to eventually take away everything except for the use verb, and that'll just feel dumb. Like, I said, "That will just feel like there's this 'solve puzzle' button. You just go around the world saying, 'Solve this puzzle, solve this puzzle, solve this puzzle.'" But it's not that way because there's a lot of other variables when you're executing a sentence in the old SCUMM games, you're not just connecting two variables, you're not just saying the verb and the noun, you're saying this verb on this noun at this time while the game's in this certain state, you know, so if a door's open or closed. So there's another dimension to all this, so context sensitive puzzle design I think was actually just more useful. Because you also had to write all the dialogue for opening an open door, and it's just stupid. It's just like, "Ugh, I'm just so tired and I don't want to write things for another joke about turning on a lamp. I don't want to write that joke." And even though people say they like finding those things, there's still plenty of hidden things to find in adventure games. Like you have all those inventory items and you have all those objects in the game, and you can still use a bucket on an egg and see what happens, you know. You can still find all those hidden jokes, so I think there's still plenty of choice with those kind of inventories. So I would say, yeah, I think that's the way of the future, is those kind of verbs, but someone could just come along with a really clever design where they pick you know, three or six verbs along the bottom of the screen that are just the most amazing, crazy verbs and they change the way that a player interacts with the world, and it's so great and they publish that game and they just prove the whole thing wrong. So, someone should go do that. I really wanted to do a game where the verbs are just different than they've ever been before. Like, the verb "vouch" like, you know when you vouch for somebody? That's an important thing. But you never like, have that verb in a game. You don't go vouching for someone usually, like "I'm going to vouch for you." So I want to make an adventure game where all the verbs are like that. They're just "vouch", you know, "empathise", I don't know, "agitate." Hang on, wasn't "agitate" one of the options for interacting with the parrot in Monkey 1? I think so! I think you're right. That's a good memory. Oh man. 78:58 frogg has asked whether you would, or whether have considered doing a game, puzzle or not, based on Terry Pratchett's Discworld? I think, a question to sort of draw there is, do you ever find yourself interested in working with other people's IP, or are you specifically interested in chasing your own new creations? Yeah, I mean I think as much as I like Terry Pratchett and how fun that world is, I would say no, because I just like to make up stuff. I think it's more fun to make up stuff. Also, I worked LucasArts for so many years. If I wanted to work on a licence, that was pretty much had access to a magical licence that, you know, as much as you get sick of Star Wars, working there - this was back before Episode I was made, so Star Wars was pretty magical back then. But it's working with someone else's ideas that is both - it's not so much that I'm putting it down, I just think it's a different skill. I think when I either solve a puzzle, I mean, a design puzzle, like if I need to solve a problem in Broken Age, I can make up - you know, we can have a tree that talks or we can just, you know, solve it that way. Like, OK, the clouds fall through, but if you have shoes on, they don't fall through. If you're working in Star Wars, that's all been decided. You know, do trees talk in Star Wars? You know, do they... well, maybe they do. I don't know. It's all been decided, and so you can't solve problems. You have to go and ask George Lucas or his representative, you know, what you can do. You've got to learn all that stuff, and I'd rather just make up my own rules for that, for sure. There's different creative people that I'd love to work with, and that's one of the reasons we had Pen Ward come up and do Amnesia Fortnight with us, but I would be scared, I mean that's the reason we started talking is we were like, you know, "There's going to be an Adventure Time game, would you guys want to make it?" You know, that just came up as a discussion topic, and I desperately would love to make an Adventure Time game, but I also am super intimidated because I could really mess - what if I didn't do that one right? That's scarier than making something from scratch, because no one knows if I messed up Broken Age, the world of Broken Age. No one can say, "That's not Vella!" Because it's by definition Vella. So you can see now, making up your own IP is just taking the easy way out. See? Creative freedom is the easy way out? I like that. Yeah, exactly. Except for if you're not creative. 81:51 LeroyOctopus has asked whether you see more sequels in Double Fine's future how that Costume Quest 2 has been announced. Yeah, I mean, I think we'll, now that we're more in control of what we make and what we don't make, and we don't have to explain... to a publisher why we're making them, we'd definitely like to do that. I think we'd still pursue the ones that are the most successful, just because there's this evidence that someone wants it, you know, and people were bugging us about Costume Quest... It was really the intersection of, people were bugging us about Costume Quest, we like Costume Quest, we want to go back to it, and we could afford Costume Quest. Like, right now, like I mentioned - like it'd be really hard for us to do Brütal Legend 2 on our own. We'd have to figure out some way to bring a lot of money to bear, you know, and same with Psychonauts. It'd be less money, but it'd still need a lot of money. So, when we figure that way to do it, someday we'll do it, but then again I also - we like making up new stuff. 82:54 Why is someone talking about Labyrinth? I was just watching Labyrinth in the car with my daughter. She loves watching Labyrinth videos on YouTube. Ah, well that was TimeGentleman. He's probably got a few webcams up on your house. That makes sense. That's only fair. That's only fair. 83:11 Mimness asks whether you are considering attending PAX Australia this year, or whether Double Fine might have any presence there. Oh my gosh. That's... It's very expensive to fly to Australia, as you Australians know when you fly to the States. So far, so far. Umm... we might. Often when I take a trip that far away, it's because someone has paid for me to fly there. They've paid for my ticket. So maybe someday, someone will pay me to fly to Australia, but umm... or I'll be rich. That's going to be the next Kickstarter, is fly Tim to Australia. Like, the museum, you know, ACMI was nice enough to fly me down for that Game Masters exhibit in Melbourne. I love Melbourne, and I would love to go back. 84:13 TimeGentleman asks, did having a kid or being a parent affect your writing of the two young characters in Broken Age. I think definitely... I mean, it's just my life with her, the life I have with my daughter is in the game, you can see it in the umm... I've spent so much time on YouTube, looking up - she found out there was such a thing as a princess cupcake, and just watching tutorials on how to make princess cupcakes. Like, that's obviously in the game, in the Maidens Feast. And just thinking about her and her life and her options, and the things she'll be up against, you know, is in my mind all the time, so I'm sure that's in the game. I'm sure that's in the game somewhere. Like I was saying, a lot of it is subconscious. A lot of it you don't do on purpose. I think, you know, Lili had a lot bigger effect on, I would say, Double Fine Happy Action Theater. You know, which is a game specifically I made for her because umm... someone's at my door. Hold on. It's TimeGentleman's rung the doorbell. I just said it was him. Ah, he's here. I was just saying that Kinect Party and Happy Action Theater are the games I made specifically for her because she was really young and couldn't handle Kinectimals, and so that game was definitely designed and tested by her, but subconsciously, just her personality is coming across a little bit more in Broken Age. I mean, she'd - the names of the characters are from her. Vella is the name she often gives to her dolls when when was really young. She would just name them all Vella, and I don't know where else that came from. And Shay was the name of the boy she had a crush on in daycare. 86:16Do you think that multigenerational collaboration, you know, do you think you might work with Lili on something someday? Do you think that there's interesting opportunities that we don't see many people exploring in the game industry, you know, working with their own kids and stuff? I think that would be awesome. I would love if she got into games. She likes playing with my [unknown]. I try to have a good influence on her and get her playing games. You know, in school they're always talking about, "Keep your kids away from video games," and I'm secretly working against that. I mean, I like - we play Super Mario 3D World a lot, because it's really fun co-op with kids, and she really likes The Cave. It's seems like a plug, but really, she loves The Cave, which is kinda creepy because you poison your parents in that game. And she loves that! And that's alarming, but she still likes it and so she plays along with - we can play those kind of co-op games together, and she likes you know, she's got some Disney Infinity stuff she likes, but if she grows up wanting to make her own games, I would be all in favour of that. For sure. 87:26 norbert_ has asked... apparently the Wikipedia article about you says that your first name is Timothy, but doesn't cite a source. Are you interested in confirming or denying that so that Wikipedia editors can have something to cite? That's funny! Umm... man, is it like The Secret of Monkey Island? Is it more exciting if I keep it a secret forever? Uh, yeah. My full name is Timothy John Shafer. We should've just asked TimeGentleman. Yeah, he probably has access to my [unknown]. Let's have a bit more of a look through the questions that we've got here. 88:08 AndyH asks, when the decision to split the game into two acts came about, did that influence the way that the story was presented in any way? Or vice versa, did the structure for the story that you had in mind lend itself towards being broken into two acts? No, the structure, the game is pretty much exactly like it was before the split. It always had this kind of cliffhanger moment. I was scared of making a cliffhanger, like I said in the documentary, because I hated the end of Empire Strikes Back, but I think it worked out. By the time we had it done, part of me was like, "Maybe I should have just ended it here. This is kind of an art film ending." Just left people wondering what the hell just happened, and not explain it, but it definitely will all get explained. So, that's all the same. What changed is that I had to hustle and get a lot of stuff in the first act that is going to pay off in the second act hopefully, and get that done ahead of time. I probably would have left that till later. So it changed the order when we produced things, but it didn't change the - it didn't change the structure. Oh! My daughter and my wife are home. It'll get noisy in a second. Alright. Well, we'll just do one last call for questions then I guess and also say thanks again for making time to hang out with us. It's been fun. Yeah! I didn't get to watch you play anything, but are you going to hopefully play now, or is it too late? We're probably going to stream a little bit of the game and just kind of chat about the game itself and chat about it in IRC. You're more than welcome to hang around for that as well. I'm probably taking my daughter out afterwards. We saw The Labyrinth a couple of weeks ago in the matinée, and that's why I was asking about those Labyrinth questions. She's very into David Bowie now. She's only five. I think that's good. I think it's well done. I think that she has good - better that than I don't know, Avril Lavigne. 90:20 liorean has asked, whether or not we're likely to see more of the Double Fine Action Cast? Yeah, I don't know. You know, we were doing nothing like that, and we did that. That was one of the first ways you could see Double Fine being casual, and then Chris Remo came along and he started doing that, then he went to Campo Santo. I feel like we've almost kind of replaced the Action Cast with a lot of the video stuff we do. You know, the Teamstreams are very similar to the Action Cast. You know, and I think what we'll probably end up doing, instead of producing more Action Cast stuff is probably end up doing more video content, so more stuff with 2 Player. Probably. But never say never. 91:06 Alright, well on that note, we should let you get going. Is there anything you wanted to ask us before you disappear. [at this point, TimeGentleman had said he liked Tim's t-shirt. We can assume that Tim said he wasn't wearing one] ...clothes right now, so I know he's lying about the t-shirt. OK! Well, it was a pleasure talking to you guys! Thanks for playing the game. Thank you so much for backing. You're very welcome and thanks for providing an interesting and enjoyable game, and the opportunity to watch it get made. Yeah. I hope you like Hack 'n' Slash when it came out - when it comes out. It was a really amazing demo of that yesterday at the Experimental Games Workshop. Brandon is crazy. Yeah, I want to have a chat with Brandon at some stage about it, so hopefully we'll come back and revisit that. Yeah. OK, well great talking to you guys. Cheers! Have a fantastic afternoon! Shellmound's name was inspired by a sign on I80 near Berkeley. Vella's family's attitudes towards the Maidens Feast were inspired in part by The Lottery. Attention from the Double Fine Game Club's playthrough and discussion of Costume Quest contributed to Costume Quest 2 moving forward. Twyla is the name of the Meriloft maiden who was left behind by Mog Chothra. Cheeseness' loyalty will be remembered after the revolution. IRC logs and links to the game and interview streams can be found in the first post of this thread on the Double Fine Forums. I'd like to extend a huge thank you to Tim for being so candid and taking time out of his weekend to chat with us, and of course Greg Rice for helping us iron out logistics. As always, my Game Club wonderful coordinator cohort Syd deserves special mention, as does Mimness for assisting me with pulling questions from the chat. And thanks also to Permafry, who hosted the Skype call for this interview and handled the following game stream. Broken Age being Double Fine's first crowdfunded project, and first project covered by a documentary covering development as it happened. Referencing a quote from the Double Fine Adventure Kickstarter campaign pitch video at 2:09: "You know how they say you don't want to see how sausage gets made? We are going to show you how the sausage gets made. We are going to take our sausage and shove it in your face, warts and all." Referencing a scene from the Massive Chalice Kickstarter campaign pitch video at 2:02 which depicts Brad Muir pitching Brazen to a demonic publisher who projectile vomits on him. Zack & Wiki: Quest for Barbaros' Treasure was developed by Capcom. There currently exist no focused or centralised resources for information on Double Fine's in-house developed engine, which has to date been used for all of their 3D titles. Somebody should remedy this. The Dialog Tree, was a character featured in early test art, first appearing in an early previs video as an example character for the lumberjack which would eventually be developed into Curtis to exchange lines of dialogue with. Disclaimer and shameless plug: I am "project lead" on Bad Golf: Community Edition, a community developed game with an open contribution policy, based on one of the unsuccessful Amnesia Fortnight 2014 pitches. Unity project source code is up on GitHub, as are official builds. The song in question is Increased Chances by Chitlins, Whiskey & Skirt, containing lyrics which refer to a post apocalyptic context. Early in Shay's story, supporting characters urge him to celebrate with THE WAVE. Regardless of which option the player chooses, the character refuses. During his first phone interview with LucasFilm, Tim had claimed to be a fan of Ball Blaster, which was the changed title of the pirated version of LucasFilm Games' Ball Blazer. A recounting can be found in Tim's TWENTY YEARS, only a few tears post reflecting on his first twenty years in the game development industry. David Bowie scared the willies out of me when I was her age. 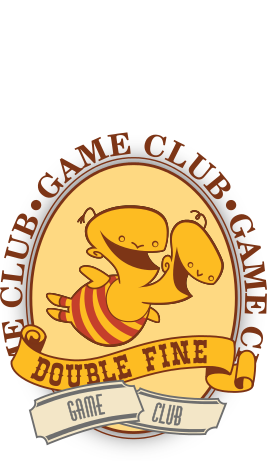 You can learn more about Game Club and find links to each game's forum thread in the Double Fine Game Club F.A.Q., via @dfgameclub on Twitter, and by hanging around the Double Fine Game Club web page around 9:00pm UTC on Saturdays. This interview was conducted as a part of the Double Fine Game Club's first session of Broken Age on the 22nd of March 2014.